Losing in the French Open final might have put a damper on her recent fantastic performance, she can at least blame it on the damp French clay courts, since the faster grass-courts of Wimbledon are far more suited to Serena Williams’ game style. She’s also been telling media that this Wimbledon is just a number, 22 to be exact but it will be hard to overcome the nerves she’s displayed in the opening match of chasing Steffi Graf’s grand slam record of 22, despite eventually beating the Swiss challenger Amra Sadikovic in 2 straight sets. This record looks like it could be an obsession for Williams and her fans. She has had so many amazing moments on the Brittish court so it could be that her biggest enemy or challenger could be herself and equalling her past play. Sadikovic who is ranked 148th in the world should have been a could warm up, but she held on during the second set against and got Williams screaming at herself for making too many unforced errors. Eventually the American made the decisive break in the 10th game of the second set, having earlier gone a break down, to secure a 6-2, 6-4 win. The crowd was on her side and should be throughout the tournament since this was her 80th win at Wimbledon, and she’ll look to make more history soon. Williams remember is the reigning champ, and the top seed at Wimbledon for the seventh time in all, and the fourth year in a row. He overall earnings are more than $77 million USD in prize money, which got her 21 grand slam titles. Sadikovic has only earned around a thousandth of that in her professional career, who played in the main draw at Wimbledon for the first time after previously retiring from the game at the age of 25 and then making her coming back. It’s been two years after coming back to the tour, where she saw rival and someone she previously beat, Eugenie Bouchard, reach the Wimbledon final. Since then, Sadikovic has already ranked higher than she managed in the first part of her tennis career. 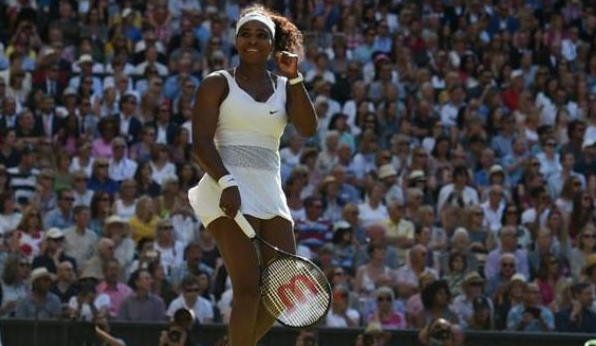 In her match with Serena, many though she could actually break the top 100 is achievable. The atmosphere in the Women’s draw is unusually queit and withdrawn, with Maria Sharapova obviously out due to her two‑year ban for taking meldonium, and Serena’s older sister Venus going into the twilight of her career, the 34-year-old’s powerful shoulders bear a lot of pressure since she is the one who has to carry the women’s game now. She knows her game was not flawless. She was hesitant on her second serve, which was slower than last year’s win, and there were a total of 18 unforced errors. The six-times champ has only one tournament victory to her name so far this year in Rome, and has time again come up just short in her attempts to match Graf’s open-era record. But no matter, even after losing in the US Open semi-finals and in back-to-back finals at the Australian Open and at Roland Garros, Williams claims that she feels less pressure than usual. You would not guess that from her game though. “I think more or less about winning Australia, I think about winning the French Open. Didn’t happen. I think about winning Wimbledon. I don’t necessarily think about winning 22,” she said, not being very convincing, after shaking hands with Sadikovic at the net. It seems like she is trying to convince herself that the pressure is not weighing as heavily on her, depite knowing that her achievements are measured by a different yardstick to any of her contemporaries. She knows she has to prove her pre‑eminence beyond all measure and the only way to do that is to match 22 and surpass it. After the match she was applauded by the fans, and from the court by her proud mother, Oracene Price. She was stoic when speaking with reporters in the press room, insisting that the mental fatigue of the tournament would not be a factor. We think she knows it’s time to get it done. And catch 22.